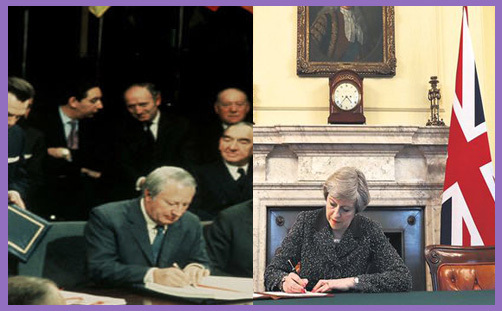 On 22nd January 1972, Conservative Prime Minister Ted Heath signed the Treaty of Rome, by which the process of UK accession to the EEC began. After hundreds of hours of debate in Parliament, the European Communities Act came into force on 1st January 1973. From Heath’s signature of commitment up to the time of political completion, a year passed. And a further 44 years passed, during which time the EEC became the EC, which then morphed into the EU. Year after year of “ever closer union” forged economic governance, policy centralisation, social consolidation and judicial amalgamation. “There is no question of any erosion of essential national sovereignty,” Heath assured the British people in 1972. He was right in one sense: given a referendum in 1975, the British people gave their sovereign assent to the project. And given another another referendum 41 years later, the people took it away. If that was what Heath meant be essential sovereignty, he was right. But it was not for the want of four decades of parliamentary collusion in the sovereignty-diminishing imposition of a European ideology which is fundamentally antithetical to the concepts of the nation state and the sovereignty of the people. On 28th March 2017, Conservative Prime Minister Theresa May put her name to the letter invoking Article 50 of the Treaty of Lisbon, which begins the process of UK secession from the EU. This will be completed at the latest by 12.30pm on 29th March 2019. From May’s signature of commitment up to the time of political completion, no more than two years may pass. It was Churchill who said that Britain must find “ties of blood, sentiment, tradition and common interest” to unite the British family of nations. Those who talk about Britain’s ‘European destiny’ have long scoffed at such talk, often overpowering rational discussion with threats of being ‘left behind’ or being handicapped in some ‘outer tier’ or ‘slow lane’ or ‘left outside’ altogether. We are about to discover that this will not be the apocalyptic disaster the doom-merchants prophesied. Despite all the restrictions, distortions and handicaps placed by the EU on Britain’s trade with the rest of the world, the strength of Britain’s bargaining power in the forthcoming negotiations with the EU is considerable. Britain is the only net consumer of many of the Union’s surplus agricultural products, a major net importer of EU manufacturers, and one of the most important providers of fishing waters to the Common Fisheries Policy. The volume of EU exports to Britain is vast, and EU member states will not jeopardise this. Even if they wanted to, WTO rules prohibit outright trade barriers. Theresa May will dedicate the next two years of her life to a favourable re-negotiation of the UK’s relationship with the EU, but ‘no deal’ would be preferable to remaining in the single market and customs union, and subject to the European Court of Justice. Sovereignty is not worth surrendering for prosperity. This England is the Mother of Parliaments: this United Kingdom remains one of the most influential of nations of the world – a permanent member of the United Nations Security Council; a leading member of the Commonwealth of Nations; and of the G7, G8, G20, NATO, the OECD, the WTO, the OSCE and the Council of Europe. No other nation in the world occupies all these positions. Britain’s historic ties, her geo-strategic position straddling the sea-lanes to four continents, and the close economic and cultural links to the great English-speaking democracies of the Atlantic and Pacific basins, all enable far wider interests and connections than simply those in and to neighbouring continental nations. By withdrawing from the EU’s ‘Little Europeanism’, we can begin once again to look to the world. And looking to the world is a thoroughly Christian pursuit: ‘and ye shall be witnesses unto me both in Jerusalem, and in all Judæa, and in Samaria, and unto the uttermost part of the earth‘ (Act 1:8). A sovereign and free Britain is not destined for autarky and isolation: there is nothing to stop us collaborating and cooperating bilaterally as the elected government sees fit. And if we don’t like the outcome, we can vote to change the government and the policy. No more will we be forced to ‘band together’ beneath the yoke of ‘pooled sovereignty’ and supranationalism. No more will democracy be eclipsed by bureaucratic, oligarchical economism and harmonisation. We shall be free to live once again within the borders of a sovereign nation, in accordance with God’s pattern for the kingdom of the earth, and a whole new world of opportunity and mission lies before us. What Theresa May signed yesterday was a declaration of independence: ‘And in thy seed shall all the nations of the earth be blessed; because thou hast obeyed my voice‘ (Gen 22:18). Nations of the earth… He that hath ears to hear, let him hear. Nation states are not anachronistic entities which anarchically agitate for dominance and power; they are God’s pattern for political authority, legal order, mutual accountability and the balancing of power. When their peoples forge constitutions of democracy and freedom, the national fabric is woven with reason, justice and peace. Sovereignty belongs to all independent states: it is absolute. When they ask tomorrow ‘Who governs Britain?’, the answer shall be: ‘The People.’ Today begins our second national revolution: may it be as glorious as the first.